You can read about how „vintage” is the pickup, how „deep” is its tone, how „the middle” is improved. All these things are based on myths. The tone character described as vintage, deep, with reach middle, etc, just can't be made only by a pickup. These things depends on the whole guitar construction (amps and effects also). 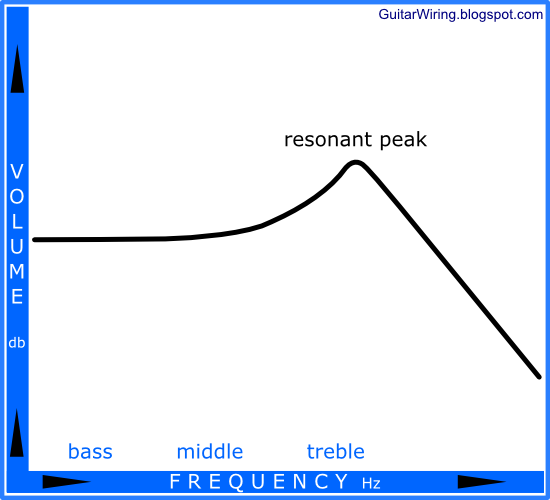 Did you seen somewhere a pickup specification, where was an EQ-style diagram, which was telling you how much bass, middle and treble the pickup has got? It's not really true. Guitar p-ups, made from coils, magnets and pole pieces just can't work like that. Maybe this way of describing works well, as something for people with no idea about how the pickup works - but not for me. As you can see, it's completely flat to some point, than it has got some peak, and drop-down. So, what are the real, important factors? What should I look for? 1. Type (P90, classic Stratocater single-coil, Tele-style, hot humbucker, medium-output humbucker, single-coil-size humbucker...). Which pickup construction type fits to your guitar and playing style? You should know the sonic difference between classic single-coil and humbucker. Remember, that the most of guitar speakers have ca 70-5000Hz frequency range. If the pickup's resonant peak is far above 5000Hz, it means flat characteristic between 70Hz and 5000Hz. It will be quite transparent „sounding” p-up. If the pickup has got the peak at ca 4600Hz, it will be „screaming”. There will be a significant treble "boost". For some people it's a cool thing, for some it's not. With the peak around 4000Hz (4K), you will lost some significant amount of high-end, but your tone will be very thick. How much signal volume do you need from the pickup? Maybe you want to get it also by using a booster or a distortion pedal? Many tube amps sounds warmer, fatter or more „tight” with stronger input signal. It also means more crunch. > This article about low-output pickups < can be helpful in this topic. BTW, the pickup impedance value don't means pickup output power. If you're comparing two similar pickups, like 'classic Strat single-coil' and 'over-wound Strat single-coil', the impedance value can be helpful. If you have two completely different constructions (different magnets, shape...), you can make a mistake by this way. Do you need some easy-to-destroy stuff? :) A cheap coil can be also very sensitive to vibrations - really bad, noisy thing. These factors are the most important. All other things, are far away from these points. They also can be significant, but if you're looking for a guitar pickups, start your critique from five factors described above. It will help you avoid some popular myths. If you want to know more about how pickup works, > here < is a selection of good articles. Some manufacturers don't publishing all important tech-data, so you need to judge their guitar pickups without real technical specification. Sometimes a "non-scientific" description also can be good, if its well-written. I think, it's a good practice, when manufacturer is giving both types of information. Not all guitarists can imagine what some numbers means.